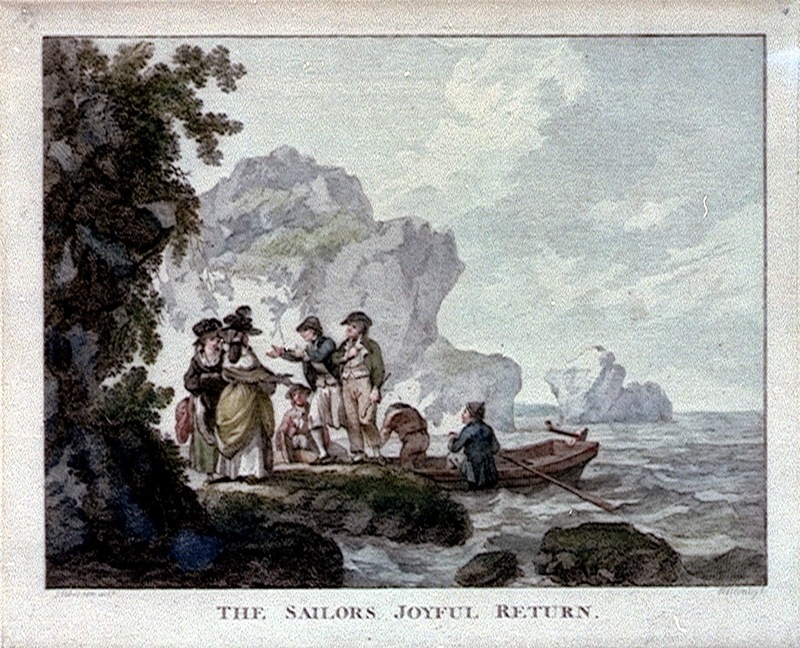 The Sailor's Joyful Return, artist unknown, date unknown, National Maritime Museum. I've been holding on to this image since this blog began. The provenance on this piece is so imprecise, I really wasn't sure that I could include it. Sailors clothing, as I'm sure you've noticed by now, changes very slowly. A tar in slops, a round hat, no waistcoat, and blue jacket would be just as at home in the 1730's as the 1790's or later. Thankfully, sailors aren't the only ones in this image. The print is a "sailor's return" cliche, and no such return would be complete without women! Based on the sleeve length and style of headwear, my wife gave me the tentative date of 1780's for this piece, which would place it within our study. 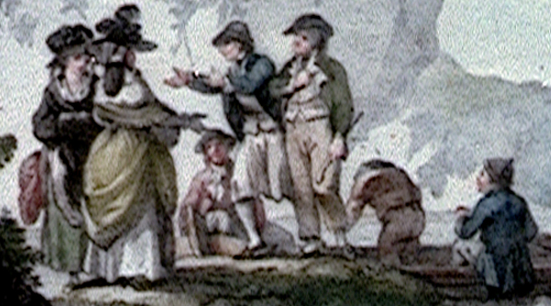 The sailors are variously dressed: round hats and knit caps; green, blue, and red jackets; slops and trousers. The sailor who sits on the far right of the above detail has his back turned to us, and appears to be wearing turnbacks on his jacket! This style is more familiar in regimental uniforms than on a common tar. It is also worth noting that the sailor in the green jacket with white lining carries a cudgel of some sort. Both he and the sailor who reaches for his lass wear single breasted white waistcoats with a slight cutaway.